On our cab ride to the Singapore Zoo, about 15 minutes north of our hotel, we started seeing more trees and vegetation and less high rises and concrete. Rowan said, “This is beautiful. This is more beautiful than the Arctic, because the Arctic doesn’t have any trees. It’s more beautiful than the hottest planet in the universe.” Kevin and I decoded that to mean that Rowan liked it. 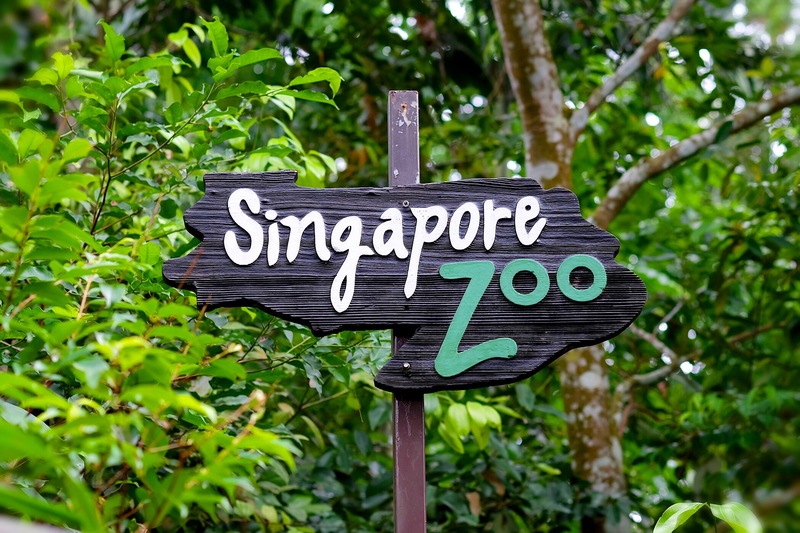 The Singapore Zoo is surrounded by lush trees of I-don’t-know-how many different varieties. It’s also hot again, about 33 degrees, so we aimed for shade whenever we could find it. We decided to visit every exhibit in the zoo, which took about 7 hours, including breaks for lunch, ice cream, and some just for sitting and cooling off. The Zoo is amazing. 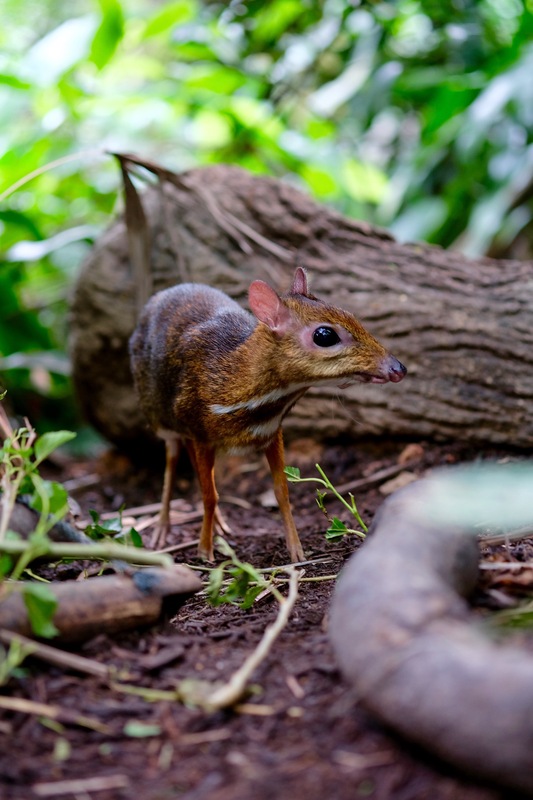 There are lots of animals that you can see in most zoos, giraffes and tigers and penguins, but also others that you don’t often get to see, like deermice and raccoon dogs. But the best parts are the free ranging animals, like the Orangutans, who can and do roam around the zoo wherever they want. Our favourite enclosure was the “Fragile Forest”, which was enclosed with doors and a net for the birds, but the animals could and did go wherever they wanted too, including anywhere visitors were hanging out. We got to crouch down right beside Ring-Tailed Lemurs and Lesser Deermice, stand a couple of feet away from colourful red parrots and Flying Foxes (kind of like large bats) and have fun looking for animals among all the vegetation, which felt a lot like creature hide-and-seek. We spent the longest time in this exhibit and I for one, didn’t really want to leave! 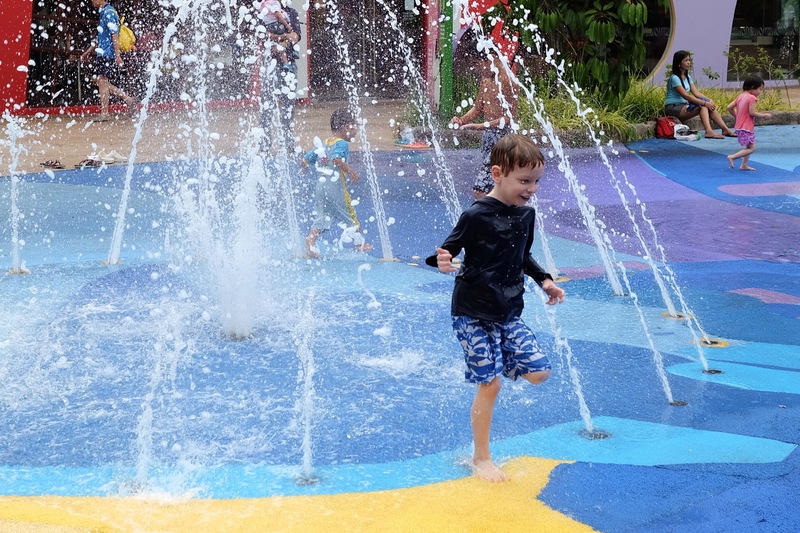 But we had to, because Rowan was keen to get to the Rainforest Kidzworld, where they had a big splashpad, where he had the chance to cool down for an hour, running through all kinds of sprinklers and fountains, and play on a pirate ship that splashed down a huge bucket full of water on the kids every 10 minutes! It was a huge hit. After that, Rowan completed a “Rainforest Challenge”, that included balancing and strength activities along winding dirt tracks amid the shady trees. Then more animals, a short seal show, and a sleepy taxi ride back to our hotel.